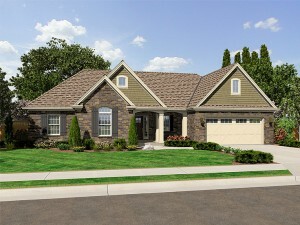 My husband and I have been looking at a home plan online that we absolutely love! But, we know we can improve it just a little bit in a few areas to better suit our needs and lifestyle. With this being our first building project, we are learning a lot. Take for instance what we learned about making changes to our floor plan. Our builder told us the modifications we want to make are fairly simple and easy to handle (making the master bedroom walk-in closet a couple feet deeper and changing the rear screened porch to a covered patio and adding an outdoor fireplace.) However, he cautioned us the building department would have to approve our changes. The changes are nothing major in our eyes, but after calling our building department we discovered they require any changes to be drawn on the blueprints before the plans are approved for building permits. Making changes after the plans are approved will cause issues with the building inspector. So, this looked like a roadblock to us until I contacted The House Plan Shop. We were happy to learn that we have a couple of choices when it comes to modifying our house plans and either choice seems fairly easy. (Looks like this won’t be a roadblock anymore, but rather just a little hill to climb.) The representative at The House Plan Shop told me we can submit a modification request to their customizing department. If we like the quote and the time frame for making the changes works with our schedule, they can handle all the changes. A designer will go over the changes with us and send a preliminary sketch before they begin modifying the plans. Our other option is to purchase a CAD file or a reproducible master and have a local residential designer, architect or even our builder (if he feels comfortable) make the changes for us. Either way, it doesn’t seem like making the changes to our house plans will be too difficult. That’s a relief! I am happy to find that wanting to change our blueprints is not going to be a setback for us, but rather just another little step we need to work into our schedule. Building a new home can be exciting and fun. There is no doubt you’ll be looking forward to moving into your new home. And once you are there, you’ll be excited and enthusiastic about decorating it, showing it to your friends, etc. These are all wonderful things to look forward to unless you end up with a home you don’t really like and features you do not want. Even worse, you could end up with a home that is missing some of the things you’ve always wanted. Keeping this in mind, be aware that it is very important that you carefully choose and decide exactly what you want with your new home. Know what you want before you buy. When you find a plan you think you really like take some time to consider it carefully reviewing its design aspects and checking to be sure the layout and features satisfy your family’s needs and lifestyle. Taking the time to decide what you want up front will ensure your satisfaction when construction is complete. Below are some of the most important things to consider when buying a house plan. Home Site: Many times, the site or lot will influence other decisions you make about your house plan including whether it is one or two stories, has a walkout basement or if it must have a narrow footprint. For example, if your lot is small and slopes to the front or side, you made need to find a plan with a drive under garage. Similarly, having a large lot to work with makes way for a sprawling ranch design instead of a space-saving two-story home. Foundation: Depending on where you plan to build may determine what type of foundation you must use. For example, coastal areas generally require a pier foundation protecting your home from the rising tides. However, if you can choose your foundation type, it is best to familiarize yourself with the various foundation types: basement, crawl space, slab, pier, and walkout basement. If you are able to build on a basement foundation, consider its many advantages such as extra storage space and an opportunity for future finished living area. If you have a sloping lot, consider the walkout basement offering convenience and easy access to the back or side yard. Style: Choose an architectural style that reflects your personal tastes and preferences. Then consider whether it blends well with the other homes in the neighborhood or will if it will look out of place. What home style will hold the best value in your neighborhood? Does the exterior style match the interior style you prefer? Will it work well with your furnishings and decorating tastes? Number of Levels: In most cases the number of levels you choose is a personal choice. Some people prefer all the common living areas on the first floor with all of the bedrooms situated upstairs for privacy. Also with a two-story, you can add a considerable amount of square footage on the second floor while spending less on materials than you would for a single level home of the same square footage. One-story living is better suited for those who wish to eliminate climbing the stairs every day, an advantage for those looking ahead to their golden years. Bedrooms: Consider the present size of your family and whether or not your family will change and grow over the years. Do you plan on having more children in a couple of years? Are your older children ready to move out on their own? Do you have frequent overnight guests that would benefit from a guest suite? Do you have plans to convert a bedroom into an office once the kids move a way? Also think about yourself. Master suites are a hot new trend in home design offering generous His and Her walk-in closets and large private baths with all the amenities such as a whirlpool tub, separate shower, compartmented toilet, dual vanities and more. What special amenities do you need in your master bedroom? Will a single walk-in closet and simple bath with one sink, a shower and toilet satisfy your needs? Consider the bedroom layout. Do you prefer split bedrooms or a design with bedrooms clustered together? Do you want a first floor master bedroom with the secondary bedrooms upstairs? Bathrooms: The arrangement of your bedrooms and the number of levels you have may influence the number of baths you want in your home. With a two-story home, will a half bath due on the first level, or do you want a full bath? What kind of master bath do you envision? Will the secondary bedrooms share a hall bath? Will it be a compartmented design? Will it have dual sinks for efficiency? Do you prefer a private bath in one of the secondary bedrooms so it can be used for guests? If you build your home on a basement foundation, do you want a full bath downstairs or will the rough-ins work for now with the possibility of finishing it later? What other special baths to you need? A half bath in the mudroom, a pool bath, a full bath in the garage? Floor Plan Functionality: When you look at floor plans, think about your family’s lifestyle and your daily activities. 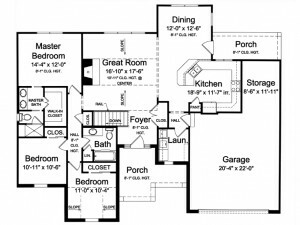 Think about how the floor plan will accommodate your needs. Is it important to have the dining room next to the kitchen allowing you to serve meals with ease? Should the garage enter near the kitchen making it easy to unload groceries? Do you want an open floor plan? Are all the bedrooms close enough to a bathroom? Pay attention to the layout of the rooms and the room sizes. Will you be able to arrange your furniture in a functional and comfortable manner? Will your dining set and china cabinet fit in the dining room? Use a tape measure to measure your furniture pieces and the rooms they are in currently. Compare room sizes to the new floor plan and evaluate if the new spaces will work for your furniture and for you. Kitchen Layout: The kitchen is the heart of the home for many families. So, choose a floor plan with a kitchen design that is large enough to accommodate your needs and offers the features you love. Sometimes the builder may be able to further enhance your kitchen by adding special features such as a snack bar or meal-prep island if space allows. Special Rooms and Features: Think about all the things your family needs and the conveniences you want. Make a list and prioritize them. You might not be able to find a floor plan with all the extras you’d like to have in your price range, but if you prioritize your needs and wants it will make it easier to determine what floor plan will work best for you. Do you want a dedicated laundry room? Should it be on the first or second floor? Do you need a den/home office? Will a playroom accommodate the kids and offer storage for all their games and toys? Do you entertain often and wish to have a wet bar? Can a special room serve multiple purposes such as using the home office as a hobby room too? Be sure to decide which special features and rooms you must have and which ones you are willing to sacrifice? Considering these points carefully will help ensure you are choosing a house plan that is well suited for your family. Have you decided to take the plunge and build a new home? If you think you are ready for the challenge, the following tips will help you make the best decisions when it comes to building a new home you can afford. Begin by getting several bids or estimates from contractors for the construction of the home plans you’ve selected. Check with lumberyards and family and friends for recommendations of reputable builders in your area. Don’t assume that the cheapest estimate is saving you the most money. Be sure to compare the quality of materials used in each estimate, and note differences if one bid includes something that another one does not. Determine what you can afford. Do your research by looking at homes that are comparable to you future home in size and cost to build and estimate your total monthly housing costs including utilities, taxes and homeowner’s insurance. Find out how much you should expect to pay in closing costs. Closing costs include a variety of fees such as fees charged by the lender, title and settlement fees, taxes and prepaid items such as homeowner’s insurance. Determine how your future home fits into your budget. Financial advisors recommend that buyers spend no more than 28% of their income on housing costs annually. Finally, look at the big picture. Building a new house is a great way to build wealth, but maintaining your investment can involve a lot of labor and be expensive. Consider what you will spend to furnish your new home, purchase appliances and landscape your yard. Consider the costs of unexpected expenses such as plumbing problems or roof repairs in the future. Will you be paying a lawn service to mow the lawn once a week or do you plan to save money by doing it yourself? It is important to plan ahead for these costs and expenses rather than finding you’ve drained your bank account and you still haven’t purchase a washer and dryer and the grass in the front yard in two feet tall. So, before you jump feet first into building a new home, be sure to do your homework where finances are considered. Select and build a home that will fit your budget rather than a dream home you might not be able to afford.